Fetal to neonatal transition is characterised by major pulmonary and haemodynamic changes occurring in a short period of time. In the international neonatal resuscitation guidelines, comprehensive recommendations are available on supporting pulmonary transition and delaying clamping of the cord in preterm infants. Recent experimental studies demonstrated that the pulmonary and haemodynamic transition are intimately linked, could influence each other and that the timing of umbilical cord clamping should be incorporated into the respiratory stabilisation. We reviewed the current knowledge on how to incorporate cord clamping into stabilisation of preterm infants and the physiological-based cord clamping (PBCC) approach, with the infant’s transitional status as key determinant of timing of cord clamping. This approach could result in optimal timing of cord clamping and has the potential to reduce major morbidities and mortality in preterm infants. Delayed cord clamping is beneficial for term and preterm infants and is recommended in current clinical guidelines. Preterm infants requiring stabilisation or resuscitation at birth generally are excluded from delayed cord clamping. Experimental studies have shown positive effects if respiratory support is started prior to umbilical cord clamping. Multiple practical issues must be addressed before cord clamping can be incorporated into stabilisation of preterm infants. Using the infant’s transitional status as key determinant for the timing of cord clamping may result in true physiological-based cord clamping (PBCC). PBCC may be able to reduce major morbidities and mortality in preterm infants. Fetal to neonatal transition is characterised by major pulmonary and haemodynamic changes occurring in a short period of time. There are two interventions where the caregiver can largely influence these changes: (1) applying respiratory support when there is difficulty breathing at birth and (2) timing of cord clamping. The best way to support pulmonary transition has always been a focus of the international resuscitation guidelines, and comprehensive recommendations are available.1 2 However, recommendations on timing of cord clamping only received significant attention in the more recent guidelines. Although umbilical cord clamping is a quick and simple intervention, the timing of cord clamping may have a large impact on the infants’ health. While it is thought that the major benefit of delayed cord clamping (DCC) is placental transfusion (blood from placenta to the infant),3 it is now evident that there are many benefits.4 Although cord clamping and stabilisation are commonly considered as two seprate interventions,5 recent experimental studies demonstrated that pulmonary and haemodynamic transition are intimately linked.6 7 In healthy term infants, pulmonary transition establishes soon after birth, but apnoeic term infants and preterm infants often need respiratory support to aerate their lungs adequately.8 Evidence is emerging that it might be beneficial to wait with cord clamping until the pulmonary transition (ie, lung aeration) has been established.9 10 As a consequence, timing of cord clamping should be incorporated into strategies for stabilising the infant. In this review, we will describe what is currently known about the clinical aspects of integrating cord clamping in the stabilisation of infants at birth. Several factors potentially influencing the amount of placental transfusion have been the subject of research, such as the position of the baby during DCC, the timing of the administration of a uterotonic drug and the mode of delivery. Yao et al 23 observed that gravity might be important if the infant is held extremely above or below the introitus with the cord intact. However, Vain et al recently demonstrated in a large randomised trial that the position of a term infant before cord clamping does not affect the volume of placental transfusion.24 This is supported by a recent experimental study demonstrating that changing the body position of preterm lambs before cord clamping has minimal effect on umbilical and cerebral blood flow.21 In fact, a much greater effect on umbilical flows and haemodynamic parameters was achieved by initiating ventilation before clamping. There are no randomised clinical trials available investigating the timing of uterotonic drug administration and cord clamping. Subgroup analysis in the Cochrane Review on DCC could not be performed because of major heterogeneity between the available studies.13 Estimating the clinical effect of mode of delivery (vaginal delivery vs caesarean section) proved to be difficult in the meta-analyses, as the estimable data were not available or badly reported.13 18 Current clinical guidelines do not differentiate in their recommendations between various modes of delivery. The haemodynamic changes that occur during the transition period immediately after birth are closely related to lung aeration and pulmonary perfusion.22 The fetal circulation is characterised by a high pulmonary vascular resistance and a low placental vascular resistance.29 Depending on gestational age, approximately 30%–50% of cardiac output perfuses the placenta, so 30%–50% of venous return comes from the placenta.30 As most of the oxygenated blood from the placenta is preferentially shunted through the foramen ovale towards the left atrium, preload for the left ventricle is largely dependent on placental venous return in the fetus. At birth, lung aeration results in an acute decrease of pulmonary vascular resistance and a simultaneous increase in pulmonary blood flow. This increase in pulmonary blood flow allows pulmonary venous return to take over from placental venous return as the major supplier of preload for the left ventricle. Recent experimental studies in lambs indeed demonstrated that clamping of the umbilical cord prior to ventilation leads to a sudden decrease in left ventricular cardiac output. This results in unstable haemodynamic parameters with an initial reflexive increase in carotid arterial flow and pressure, followed by a decrease in carotid arterial flow and pressure and heart rate.6 7 In contrast, when lambs were first ventilated and subsequently clamped, systemic and cerebral haemodynamic parameters remained stable and led to higher systemic and cerebral oxygen saturation when compared with clamping before ventilation.7 It is possible that the observed beneficial clinical effect in preterm infants (less IVH and NEC) can be more ascribed to this stable haemodynamic effect than to placental transfusion. These lamb studies indicate that timing of umbilical cord clamping must be guided by physiological parameters, rather than an arbitrary period after birth. To accomplish lung aeration before the cord is clamped, preterm infants should be stabilised while the cord remains intact, and cord clamping should be integrated in the stabilisation process.31 This so-called physiological-based cord clamping leads to a more gradual haemodynamic transition and may take longer than the predefined times used so far.26 Continuous assessment of the transition of the infant by the neonatologist will identify the optimal moment of cord clamping. Although PBCC might seem a logical approach, numerous practical issues, as well as potential pitfalls, need to be addressed before implementation of PBCC is possible. For performing PBCC, it is necessary to continuously assess the cardiorespiratory condition of the infant to decide about the optimal timing of umbilical cord clamping. When the infant is spontaneously breathing with adequate tidal volumes and has adequate oxygenation that allows the fractional inspired oxygen (FiO2) to be decreased, this informs the clinician that lung aeration has occurred and that pulmonary blood flow has increased. At that moment, the infant’s respiratory function is stable, and the cord can be clamped with minimal haemodynamic disturbances. When incorporating cord clamping into stabilisation of preterm infants, it is imperative that the cord is not kinked nor stretched during the procedure. The length of the umbilical cord is the most important limiting factor and is highly variable between infants.38 Mean umbilical cord length for term infants ranges between 50 cm and 60 cm, but variation is substantial.39 40 For very preterm infants, the available data are scarce, and total length of the cord mostly ranges between 35 cm and 50 cm.41 In a practical application of PBCC, neonatal caregivers must be able to approach the mother and the birth canal as close as possible in order to include infants with a short umbilical cord. Quality improvement projects implementing DCC in clinical practice have shown good feasibility and improvement in clinical outcomes.42 A multidisciplinary team approach, including key leadership from the obstetric and neonatal departments, is an important factor for successful implementation of PBCC.43 Obstetrical and neonatal clinical teams are literally merged at the bedside of the mother, requiring univocal agreements in the prescribed protocol. Next to training the teams on the new approach, briefing and debriefing with the entire team before and after each procedure is essential. Continuous communication between all members of the teams is pivotal to optimise the procedure and to minimise the risks. The approach of PBCC requires unobstructed work fields for both obstetrical and neonatal caregivers. During the procedure, the obstetrical team must have good access to the mother to assess maternal blood loss and uterine contractions. Specifically, in case of caesarean delivery, blood loss must be monitored continuously. In case of twin delivery, it is important to monitor the condition of the second twin after the first one is born, so access to the mother’s abdomen with ultrasound must be possible. The neonatal team must be able to give appropriate respiratory support to the preterm infant with the cord intact without obstructing the obstetrical team. This is possible near the mother’s introitus, but probably more convenient and less obstructive just above the maternal pelvis. A preterm delivery is a stressful event for parents, especially when the infant is separated from the mother immediately after birth.45 The first mother-to-child contact, which is possible during PBCC, may be essential for short-term and long-term bonding. Research on the effect of very preterm birth and the given care on parents’ experiences is ongoing. So far, only a few clinical studies investigating respiratory support in preterm infants prior to cord clamping have been performed. The feasibility was reported in a pilot study of 29 very preterm infants.46 Infants received respiratory support during 90 s after birth with the umbilical cord intact without maternal or neonatal safety concerns. Resuscitation beside the mother’s hip was not possible in vaginal deliveries due to the length of the umbilical cord, so resuscitation was then started near the introitus. Feasibility was confirmed in a randomised clinical trial of 150 very preterm infants born by caesarean section randomised to DCC (60 s) in combination with ventilation while connected to the placenta (V-DCC) or without ventilation.47 V-DCC was feasible in 78% of infants, but it did not lead to any measurable clinical improvement immediately after delivery or reduced subsequent neonatal morbidity. In the cord trial, very preterm infants were randomised between ICC within 20 s and deferred cord clamping for at least 2 min with neonatal care started at the bedside.48 There were no statistical differences in clinical outcomes, but the study was a continued pilot study and not powered to detect clinical differences. In 40% of infants allocated to the DCC group, cord clamping was performed earlier with most of them close to 20 s. The infants were not monitored, and no information was available whether the infants could be adequately stabilised or were stable at the time of cord clamping. In summary, the current experience is that due to technical limitations of the available devices, it is certainly not always possible to perform stabilisation with intact umbilical cord. An important consideration is that all aforementioned approaches used a predefined fixed time period for providing respiratory support prior to clamping of the cord. Hence, the rationale for most of these studies was to allow for placental transfusion. The transitional condition of the individual infant was not used in determining the optimal moment of cord clamping, and physiological parameters were not measured and collected. We speculate that this could provide an explanation for the lack of effect of these approaches. We therefore advocate that future studies adopt a physiological-based approach to determine the optimal timing of cord clamping. To improve transition in preterm infants and to perform PBCC, the ABC project was initiated in Leiden University Medical Centre (Leiden, The Netherlands). 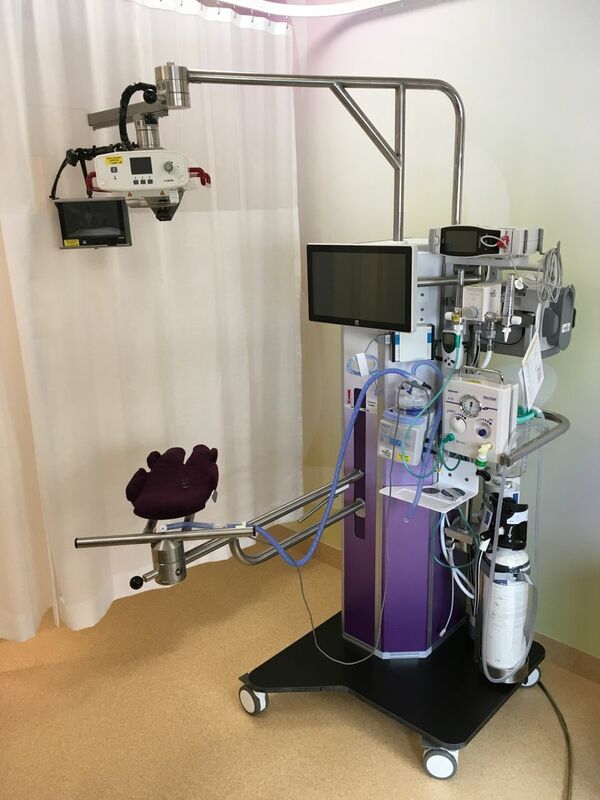 A collaborative initiative of the neonatal, obstetric and medical engineering departments has resulted in a specially designed resuscitation table (figure 1). The new table has a platform for the infant, which can be turned above the mother’s pelvis and allows the infant to be kept close to the mother without stretching the umbilical cord. The table is fully equipped to provide complete standard care. 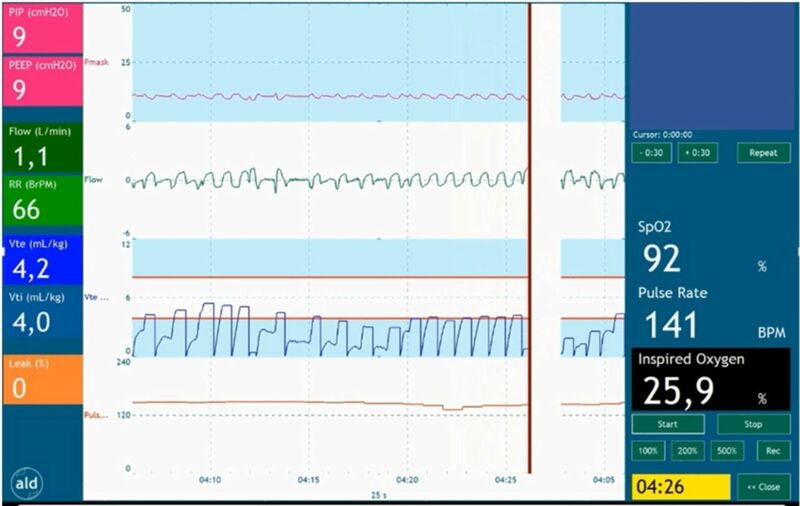 An integrated respiratory function monitor depicting the respiratory function, oxygen saturation and heart rate provides feedback on the infant’s transitional status (figure 2). In this way, it is possible to delay cord clamping until the preterm infant has been stabilised. ‘Stabilised’ is defined as the establishment of regular spontaneous breathing evaluated on the respiratory function monitor, heart rate above 100 bpm and oxygen saturation above 90% while using FiO2 <40%. Using this ABC approach will result in true PBCC, as the infant’s physiological status prescribes the timing of cord clamping. It will also allow the mother to have the essential immediate first (physical) contact with her baby. At this moment, results of the feasibility study are under review, and infants are included for the efficacy study. Specially designed new resuscitation table, including the platform for the infant, which can be turned above the mother’s pelvis. The table is fully equipped to provide complete standard care and has a respiratory function monitor built in. Respiratory function monitor depicting the respiratory function, oxygen saturation and heart rate; thus, providing feedback on the infant’s transitional status. The timing of cord clamping is after the establishment of regular spontaneous breathing evaluated on the respiratory function monitoring, together with heart rate above 100 bpm and oxygen saturation above 90% while using FiO2 <40%. FiO2, fractional inspired oxygen. To improve transition in preterm infants, recent initiatives have been focusing on starting respiratory support prior to umbilical cord clamping. Although experimental studies have shown positive effects, clinical data are still needed. Incorporating cord clamping into stabilisation of preterm infants could lead to a more optimal placental transfusion and a more gradual haemodynamic transition. The moment of cord clamping should be based on the infant’s transitional status as key determinant. Moreover, infants needing stabilisation or resuscitation can be included and will be able to benefit from the placental transfusion and PBCC. We hypothesise that this approach will result in optimal timing of cord clamping and thus will be able to reduce major morbidities and mortality in preterm infants. Further clinical studies are needed to establish the beneficial effect of PBCC in preterm infants. WHO. Guideline: Delayed umbilical cord clamping for improved maternal and infant health and nutrition outcomes. Geneva: World Health Organization, 2014.
. Effect of delayed cord clamping on very preterm infants. Am J Obstet Gynecol 2015;213:676 e1–7.
. Effect of gravity on placental transfusion. Lancet 1969;2:505–8.
. Umbilical cord length as an index of fetal activity: experimental study and clinical implications. Pediatr Res 1982;16:109–12.
. The length of the human umbilical cord: a statistical report. Br Med J 1960;1:546–8.
. Interventions to prevent hypothermia at birth in preterm and/or low birthweight infants. Cochrane Database Syst Rev 2010;3:CD004210. Contributors RK wrote the first draft of the manuscript. All authors contributed by modifying and editing the manuscript. RK and ABtP processed the final remarks and accounted for the final version of the manuscript. Funding ABtP is recipient of a Netherlands Organisation for Scientific Research (NWO) innovational research incentives scheme (VIDI 91716428).